In Vedic astrology the planet Saturn is called SHANI. In Sanskrit Shani comes from SANISCHARA, which means, "slow mover". From Shani we get the word "shun", which means to ignore, or lose awareness of something. Thus, Saturn represents a loss of awareness, or ignorance. This loss of awareness can also mean the diminishing awareness of the material world of manifestation. Here Saturn indicates the ascetic, rich with inner spirituality, and lost to this material plane of existence. Saturn is a malefic graha. He rules over the two sidereal signs of Capricorn (Makra) and Aquarius (Kumbha). He is exalted in Libra (Tula), and fallen in the opposite sign of Aries (Mesh). Saturn Significance: Saturn is a karaka, or indicator, of longevity, misery, sorrow, old age and death, discipline, restriction, responsibility, delays, ambition, leadership and authority, humility, integrity, wisdom born of experience. Saturn also indicates asceticism, denial, non-attachment, spirituality, hard work, organization, reality and time itself. Saturn's most successful place in the chart is in the 6th, 8th and 12th houses. He is a particularly beneficial planet for Taurus and Libra Ascendants. Saturn's nature is Vata, or Airy. His gem is Blue Sapphire and all black stones and his metal is Lead. Saturn's direction is west and his day is Saturday. He reaches full maturity at age 36. 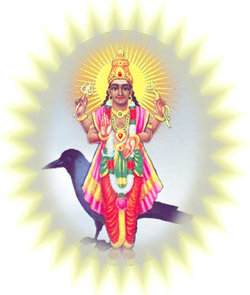 In Vedic myth Saturn is the son of the Sun, born to his shadow wife, Chaya. Saturn is lame because one of the Sun's first wife Sanjana's children became angered with him and struck him in the foot. Thus Saturn walks with a limp, which accounts why he is the slowest of the Grahas. Saade Sati : The graha SANISCHARA (Saturn), also known as Manda, is generally known to affect one adversely on occasions when he occupies certain positions in one's horoscope like Saade Sati (7 1/2 years) Ashtama Shani (Saturn in 8th house-2 1/2 years) etc. Saturn slowest planet: He is the Lord of Makaram and Kumbam. He is the slowest moving planet taking 2 1/2 years in each Rasi, completing one cycle every 30 years. Saturn relations with planets: Saturn rules over the zodiacal signs Capricorn and Aquarius. Mercury, Venus, Rahu, and Ketu are its friends and the Sun, the Moon, and Mars are its enemies. Jupiter is neutral in friendship. Shani Friendly Signs: Its friendly zodiacal signs are Taurus and Gemini and it works well and gives good results in Sagittarius and Pisces. Enemy signs are Cancer, Leo, and Scorpio. In Indian astrology, Saturn is considered to be a malefic amongst the malefic but its last effect is happy. Throwing man into misfortunes and calamities, the Saturn ultimately saves the man. He is regarded the strongest of all planets. A prayer to this Devata, especially on Saturdays, is said to mitigate the hardships one will have to face during these periods. Sanischara bestows all benefits to the devotees who pray sincerely to him. The legend that depict the influence of the worship of SHANI goes as follows, and is narrated whenever a worship or offering is made to the deity. The legend pertains to a king. The king invited merchants from far and wide and proclaimed that the king himself would purchase all unsold goods. The merchants were happy. Once a blacksmith brought an iron image of Saturn for sale, which ultimately was purchased by the king, who installed that in his palace with reverence. Other gods became unhappy on this action of the king. At night, the king saw a brilliant woman going out of the house. On king's enquiry, he learnt that, it was Lakshmi. She said that she could not stay in the place where Saturn is present. After sometime a male image went out and was told to be Bhaivabh (Prosperity). Similarly all other gods Dharma (Religion), Dheriye (Patience), Kshama (Pardon) and all others went out. When the last Satya (Truth) was going out, the king protested and said that because of faith in Satya, he did not object to the others from going out. Feeling the sentiments of the king, Satya stopped. All other deities were waiting outside for Satya, but when he did not come out Dharma (religion) said that he could not remain without Satya; so he returned in. Similarly all others followed suite and all gods and attributes came back inside the palace. They told the king that only because of his devotion to the Satya (truth); they all had to return and that such a king could never be unhappy. Due to the devotion to Satya, (truth), Lakshmi (wealth) and Shani (Saturn) came to live together, to the benefit of the devotees.